This volume considers how women are shaping the global economic landscape through their labor, activism, and multiple discourses about work. Bringing together an interdisciplinary group of international scholars, the book offers a gendered examination of work in the global economy and analyses the effects of the 2008 downturn on women's labor force participation and workplace activism. 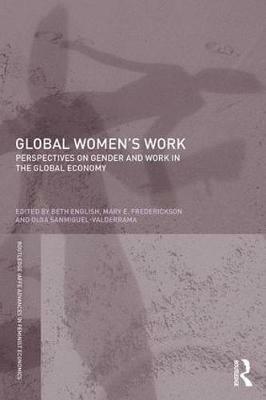 The book addresses three key themes: exploitation versus opportunity; women's agency within the context of changing economic options; and women's negotiations and renegotiations of unpaid social reproductive labor. This uniquely interdisciplinary and comparative analysis will be crucial reading for anyone with an interest in gender and the post-crisis world. Beth English is Director of the Project on Gender in the Global Community at the Liechtenstein Institute on Self-Determination at Princeton University's Woodrow Wilson School of Public and International Affairs. Mary E. Frederickson is a Visiting Professor at Emory University in the Rollins School of Public Health, and Professor of History Emerita at Miami University, Oxford, Ohio, where she taught from 1988 to 2015. Olga Sanmiguel-Valderrama is an Associate Professor in the Department of Women's, Gender and Sexuality Studies and the Director of the Latin American, Caribbean and Latinx Studies Program and the Social Justice Certificate at the University of Cincinnati.